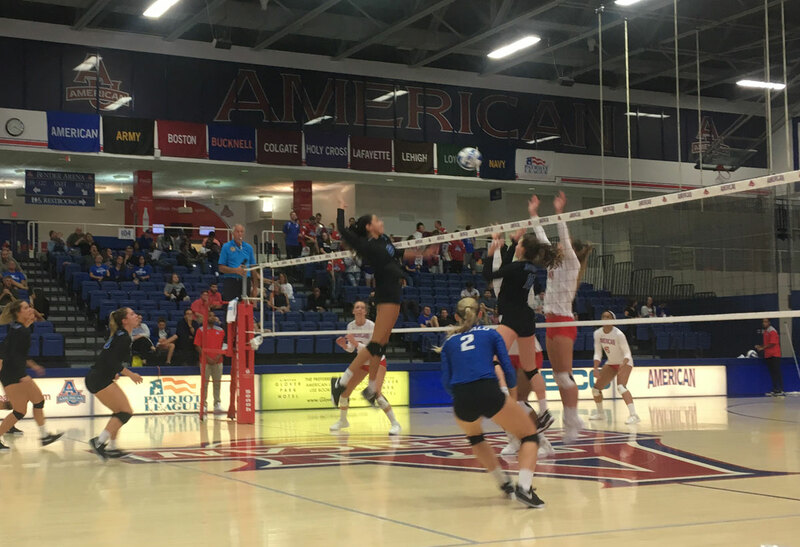 WASHINGTON, D.C. -- The University at Buffalo volleyball team opened the weekend at the American Volleyball Classic with a bang as the Bulls swept the host team 3-0, hitting .360 on the evening. UB took the contest 25-19, 25-23, 25-14, as the Bulls improved to 7-3 on the year. The Bulls rushed out to an early 8-2 run in the first set, which was capped off on three straight service aces from sophomore Andrea Mitrovic. The Bulls extended their lead in the first set to 15-4 following an ace from Polina Prokudina before American made a late run, pulling within 23-18. UB was able to close out the set following a kill from Kristina Nieves, giving Buffalo the 1-0 lead in the match. 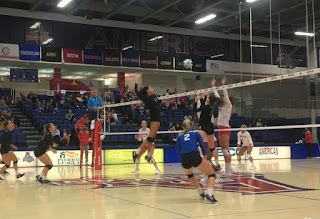 Buffalo scored the first five points of the second as American took the early timeout, but the Eagles responded with an 8-1 run and then went on to lead by as much as 14-9 before UB would go on a 6-1 run to tie the set back up at 15-15. American then went back ahead 21-17 before the Bulls rattled off four straight points to tie it up following a block from Tia Gleason and Megan Wernette. The Eagles scored the next two points as UB called timeout trailing 23-21, but American would not score again. Wernette came out of the timeout with a kill and then UB got back-to-back blocks, the first coming from Nieves and Mitrovic and the second coming from Gleason and Nieves as Buffalo went ahead 24-23. UB clichéd the set on a double contact call on American's setter. The Bulls hit .500 in the final set as they had 17 kills and just three errors on 28 swings. The Bulls raced out to the 9-4 lead in the set and unlike the first two, UB never let American get back in this one. A kill from Mitrovic increased the Buffalo lead to 15-5 and the Bulls led by as much as 22-8 in the third. Junior Rachel Sanks ended the match with a kill, clinching the 25-14 win. Mitrovic led the Bulls with 16 kills as she hit .406 on the night, including three aces. Nieves and Prokudina each had eight kills, while Wernette added five and Sanks had four. Gleason was efficient running the offense as she finished with 34 assists, eight digs, and three blocks. As a team, UB had 8.0 total blocks led by four each from Nieves and Wernette. Senior Larra Bickelhaupt finished with nine digs. Buffalo will return to action at the American Volleyball Classic tomorrow with a pair of matches beginning at 1:30 pm when UB takes on nationally ranked Penn State. UB closes out play at 4:30 pm against Howard.